Research at Children’s Hospital Los Angeles brings us closer to understanding an elusive complication of sickle cell disease – the silent stroke. Sickle Cell Disease (SCD) is rare but devastating. Due to a genetic mutation affecting hemoglobin, the component of the red blood cell that carries oxygen, a reduced amount of oxygen is supplied to vital tissues and organs. Blood cells also deform into a characteristic crescent shape and lodge into the smallest blood vessels, blocking blood flow and leading to excruciating pain. On top of these symptoms, patients face a high risk of stroke, the leading cause of death in SCD. Silent strokes can have debilitating effects on executive function, the brain’s ability to execute complex tasks needed for things like maintaining a job or doing well in school. Dr. Wood is working to discover what causes these devastating silent strokes. On the surface, the cause for these strokes seems clear: blood cells are damaged in SCD, so the brain receives less oxygen. Less oxygen to the brain results in strokes. But Dr. Wood found that total oxygen to the brain is not actually reduced in SCD patients. His research shows that the body compensates for reduced oxygen content of the blood by increasing blood flow to the brain. This led him to wonder why these patients were continuing to suffer strokes. “I began to think, ‘maybe there’s a distribution problem,’” Dr. Wood says. “Total blood flow is fine, but is it going where it needs to go?” Using an advanced imaging technique called arterial spin labeling to measure blood flow, Dr. Wood’s team found a disparity among brain areas. While total oxygen delivery to the brain was unchanged, oxygen delivery to the white matter was reduced by more than a third – 35% – in patients with SCD. Critically, this part of the brain – the white matter – is where the majority of silent strokes occur in these patients. Grey matter is composed of neurons, the brain cells that store information. White matter is the network of highways in the brain that neurons use to transmit this information. Dr. Wood’s finding demonstrates that the body differentiates between grey and white matter, clearly prioritizing neurons. This makes sense because keeping neurons alive is critical for survival. Strokes in grey matter are immediately catastrophic, while strokes in white matter appear silent because they simply cause informational processing to slow. Though they may not cause paralysis or major motor deficits, effects of white matter silent strokes can greatly impede important aspects of a patient’s day to day life. The idea that blood flow can be adjusted to compensate for challenges like decreased oxygen is part of our design. When our physiological state changes, the body diverts blood to pertinent areas. During exercise, for example, blood flow is increased to our muscles to help meet metabolic needs, but decreased to the less immediately relevant digestive tract. Similarly, under the stress of low oxygen in SCD, blood flow is diverted to neurons in the grey matter to prevent their death. Dr. Wood found that the oxygen delivery to the white matter was critically sensitive to the hemoglobin level – the more severe the anemia, the lower the oxygen delivery to the white matter – a powerful correlation that supports what he sees in the clinic. Dr. Wood’s study is the first to use arterial spin labeling to quantify oxygen delivery separately to the white and grey matter in the brain, correcting for patient’s anemia severity. His research paves the way for a better understanding of strokes in SCD but it also has broader applications. He says the findings likely shed light on anemia in general, which is a growing concern in our aging population. He also hopes this technique will help the medical community assess how current and future SCD treatments, like novel gene therapy approaches, affect the brain. Results of this study were published recently in the American Journal of Hematology by lead author Yaqiong Chai, a senior PhD candidate. The study was funded by the National Heart Lung and Blood Institute of the National Institutes of Health. Other authors on the study include Adam M Bush, PhD; Julie Coloigner, PhD; Aart J Nederveen, PhD; Benita Tamrazi, MD; Chau Vu, MS; Soyoung Choi; Thomas D Coates, MD; and Natasha Lepore, PhD. 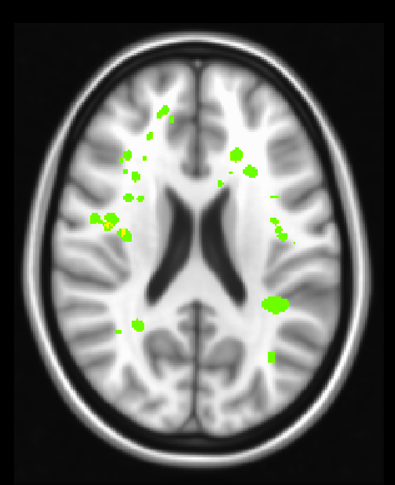 Silent strokes (green) are overlayed on a structural MRI scan. Note that strokes appear almost exclusively in the white matter.